Electric kick scooters can be a perfect mode of transportation for getting from your house to the bus station… or the train station to your place of work. 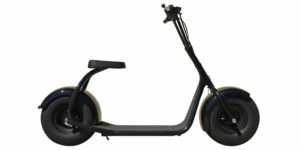 They are usually smaller than electric bikes, more stable than electric skateboards and priced affordably. 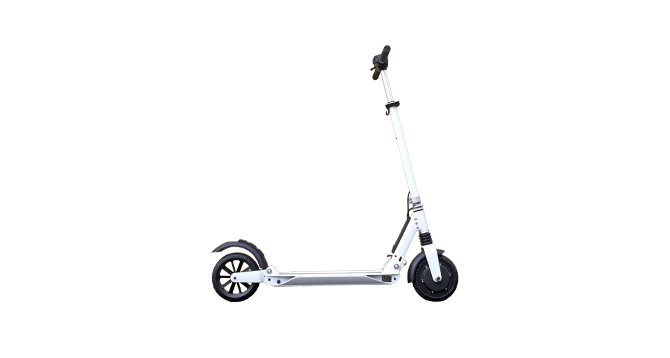 With the E-Twow you get a sharp looking, folding e-scooter in either white or black for ~$999. It’s available in three flavors including Eco, Master and Booster with 350 watts, 450 watts and 500 watts of power respectively (each progressive power increase also moves the top speed up by ~1 mph). 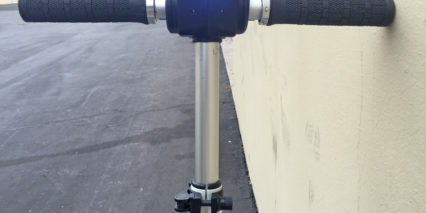 I’ve reviewed several other kick scooters and found the E-Twow to be unique in having a headlight, weighing under 25 lbs and offering both regenerative braking as well as a friction skid-brake integrated into the rear fender. 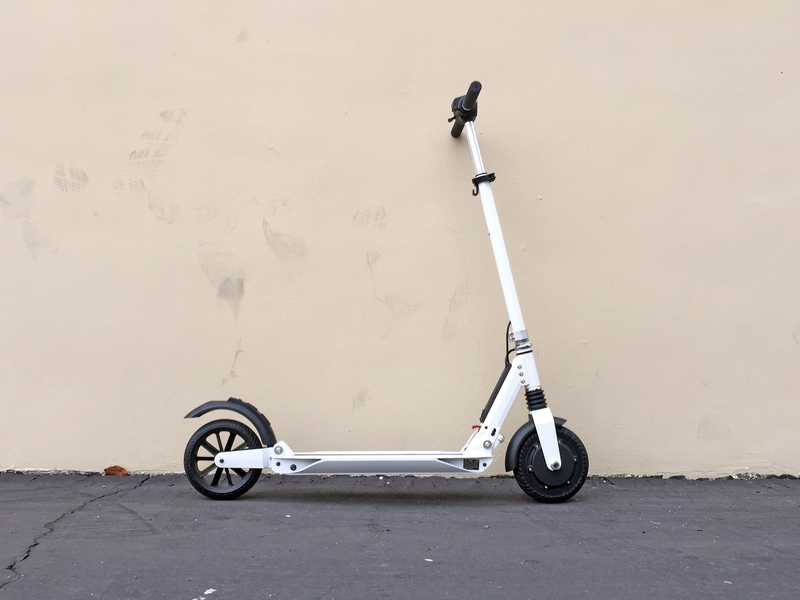 With a top speed of ~18 mph (for the Booster model) and max load of ~165 lbs it’s capable but clearly not for everyone… At ~135 lbs myself, I found the scooter to be zippy but somewhat jittery at higher speed due to the handle bar design, I’m not sure I’d want to carry a big heavy backpack along on this thing. I love the dual suspension setup however because the solid-rubber tires aren’t super forgiving. The regenerative braking activated smoothly and actually stopped me in a short amount of time when fully engaged. One area that did feel a bit limiting was deck size. My shoe size is ~9.5 Men’s and my feet didn’t fit onto the deck without adjusting the back foot a lot. 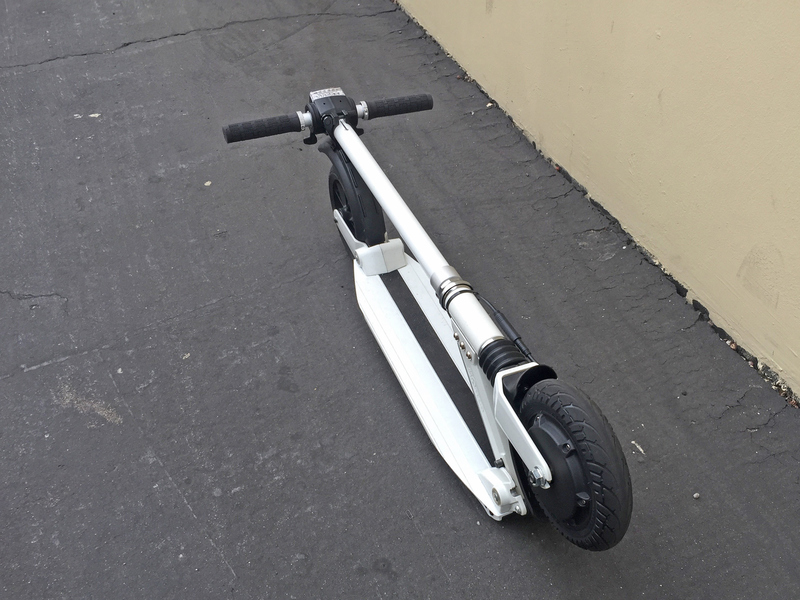 This happens on most other kick scooters I’ve tried but many of them do not have the friction brake at the rear so I’m able to rest my foot on top of the fender. 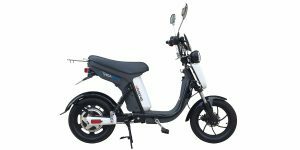 The EcoReco M5 is a great example of this… with the E-Twow I couldn’t put my back foot on the fender comfortably for stabilization without accidentally activating the brake. This created a feeling of instability for me at times. I wanted to spread my legs out to improve balance as speed increased but it just wasn’t possible, as a result I kept my speed a bit lower… especially while filming. Thankfully, the trigger throttle offers variable speed control and even shifts in to cruise control if you maintain the same speed for five seconds. This reduces hand and finger fatigue. When folded, the unit gets pretty small and feels very stable to lift, though a bit front heavy. 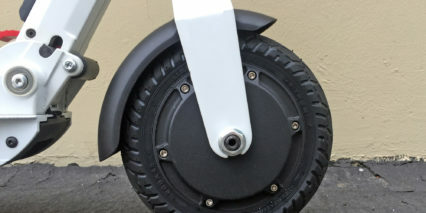 Driving the E-Twow (which stands for Electric Two Wheels btw) is a front mounted gearless direct drive hub motor unit. For the Booster model shown here, the motor is rated at 500 watts. This can be confusing because many full sized electric bikes don’t offer motors rated this high, when you look at the torque rating things start to make more sense. 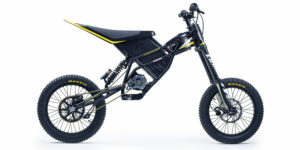 This scooter offers 15 Nm of torque whereas full sized electric bikes tend to peak out at 40 Nm. Given the smaller wheel diameter of ~5 in the motor gets a big mechanical advantage over bicycle wheels which are often 26″. In short, the motor works great and should be very durable if you don’t completely submerge it in water. Note that the motor will not activate unless you kick the scooter yourself up to ~2 mph (or adjust the menu settings and disable this safety feature). The idea is that someone could accidentally bump the throttle and have the scooter takeoff when the rider is not ready. In short, the motor works well for powering the E-Twow and also doubles as an engine brake by using regen. Many other kick scooters put their motors in the back wheel but I didn’t notice much of an impact on steering or handing here, it’s not super heavy. The biggest consequence of motor orientation here is that the unit is front heavy and tips forward if you try to lift from the center (when folded). One final heads up here is that motor produces some cogging drag because the electromagnets inside repel when the unit is coasting or powered off… it’s not terrible but it does impact coasting and could be a real drag if you run out of juice before reaching your destination. Expect 15+ miles of range for heavy riders or those carrying large backpacks. Unfortunately, I don’t know much about the battery on this electric kickscooter. It’s built right into the deck and designed to stay there. You can easily charge it using the power port at the base of the stem but I’m not sure about replacements and you probably cannot charge it separately. For this reason I recommend storing the unit inside. Keep your scooter topped off if you haven’t used it for a couple of months to avoid a full discharge. Extreme heat and cold can damage Lithium batteries and this one uses a Lithium Polymer pack. 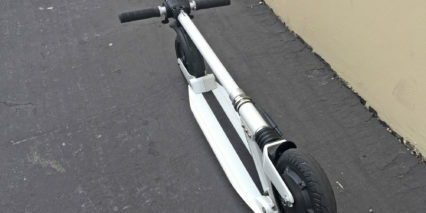 Based on other similar kick scooters I’ve researched and tried, my guess is that this one is running at 36 volts 7.7 amp hours. 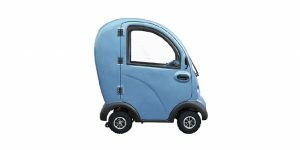 The website says that it has a capacity of 280 watt hours and given the larger motor sizes on this and other models a 36 volt setup just makes sense (but comment and correct me if you own this and have found otherwise). Note that another big differentiator between the Eco, Master and Booster is battery size with 190 Wh, 250 Wh and 280 Wh respectively… Larger size means extended range. Operating the Etwow from KERS Technology is more interesting than most electric kick scooters. It’s designed to charge in ~2 hours using the included 3.5 Amp quick charger and from there, you just press the rubberized power button at the base of the display. The monochrome LCD screen is backlit and includes a light sensor to automatically engage. You get all of the standard readouts including speed and battery level as well as odometer, trip distance and a light icon. The headlight is a neat extra that very few scooters seem to include. I love the way it’s integrated and appreciate just how large and bright it is (you get 6 white LED’s!) there are three other buttons on the base of the display including a very annoying horn, light activator and the mode switch (odometer to trip distance). Even though you get lots of extra information and a more precise speedometer on this scooter it’s still easy to operate and doesn’t have to be confusing. You can simply turn it on, move the unit forward a bit and press the right throttle to get going. If you want to slow down, just use the left throttle to activate regen… simple. I like how organized it feels and the fact that the two throttles are symmetrical and both offer a smooth, spring actuated lever so you can ease into starts or stops. At full blast, this thing can start and stop surprisingly quickly. The only complaint I have about the cockpit is that the fold up handlebar and grips seem a bit loose and rattly. Once they are in the up position it can also be difficult to get them folded back down, look for the little rubber mound that faces you and is near the inside of both grips and press it hard then pull the grips out to fold down. 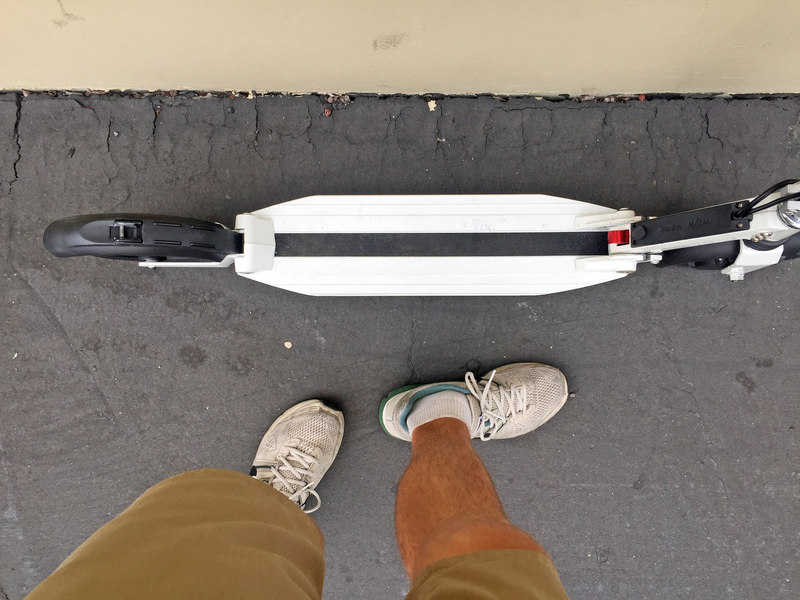 To date, this is one of my favorite kick scooter options… despite the limited deck space and handlebar issue. I just like the regen AND skid brake and the unit feels high quality. 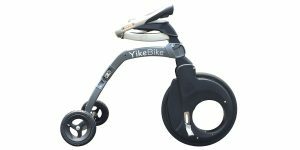 If you’re someone who needs to solve that “extra mile” problem and are looking for a light weight kickscooter that’s built better than the cheap kids ones, this could be a great choice. There are definitely areas where this could be improved and I’d like to know more about how the warranty works (or if there is one) but overall it feels like a professional product. I also really like the EcoReco scooters and appreciate the colored wheel accessories, bags and trailer option (which the E-Twow doesn’t seem to have). Given the friction brake I feel like the rear wheel could wear out more quickly and it would be nice to know how to get a replacement, it would also be nice to see more pricing information at the official website. 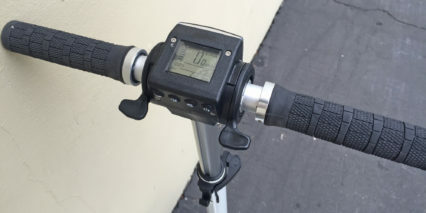 If you go to the U.S. website at http://www.etwow.com they have videos of how to open and close scooter which there is a trick to you must push slightly forward on handlebar as you push the red lever with your foot which was done for safety so not to fold while riding, how to change from km to mph and how you can either do a kick start or start immediately with the throttle by changing a setting. 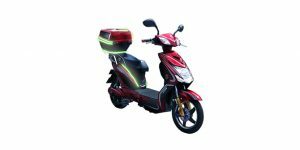 On the site it states the scooter has a one year warranty on the scooter and 6 months on battery. They also have new enhanced hand grips on the Booster model since your review so they are much easier to fold now. 1. Their website says max load is 110kg, or 242.5 pounds. That makes sense, as a 165lb. limit would make the scooter unsellable to most American adult males. 2. The battery is 33v, 6.5 amps. It’s not 36v, although I wish it was. 4. While the website says it will climb 25 degree slopes, that is, uh…”highly optimistic”. Scooter makers are well-known to exaggerate a scooter’s stats (I’ve never understood why, since the plain truth is always so much nicer and more useful), and E-twow is no different. This scooter will climb up to a 15 degree sloop. Anymore than that and you WILL be kicking to help the scooter out. 5. Likewise, maximum real-world range is about 10-12 miles. I suppose 15 is theoretically possible, on completely flat pavement and only using 50% power the entire time. But who rides an electric scooter like that? You mentioned the EcoReco. In your opinion, if you HAD to chose one over the other, which would it be, and why? I’ve asked this question of a few vendors, and none seem to want to give a straight answer. I’m certain they probably prefer one over the other, but they sure don’t want to say so! Thanks again for the review! Love your website! Thanks, Court. 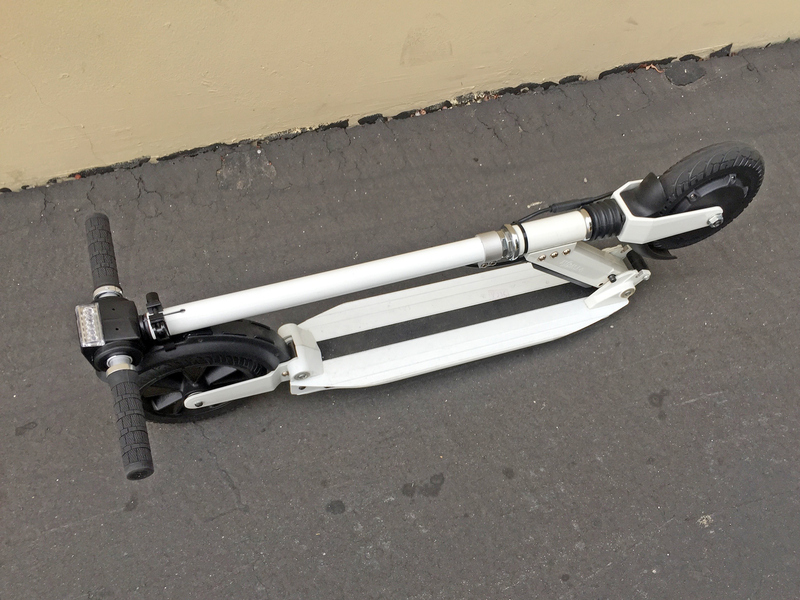 I’ll eagerly await the review of this mystery scooter. I’m in the market right now, and have been VERY close to pulling the trigger on an E-Twow. For my purposes it seems like it might be slightly better than the EcoReco. But if you say there’s another option you feel is better than both of those scooters, I’m all ears! 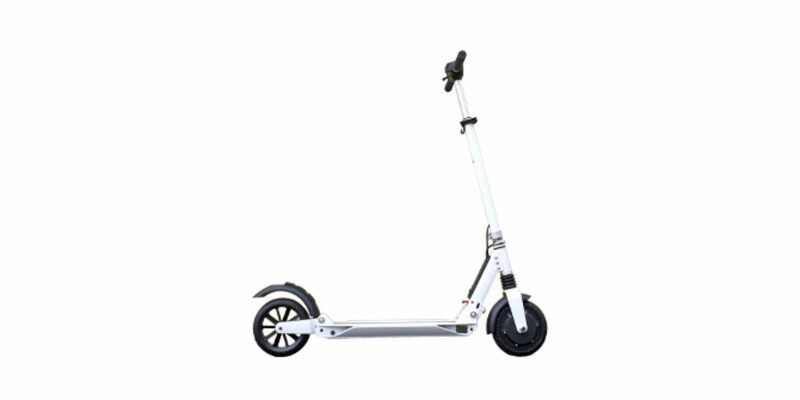 Especially since that’s precisely what I’m looking for…a scooter that’s at least slightly better than both the EcoReco and E-Twow. 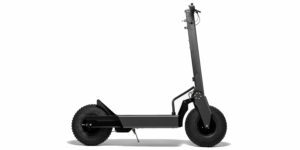 I know Glion, EcoReco and E-Twow have been the biggest (and really only) scooters widely available in the last year, so if there’s something new around I would love to check it out! 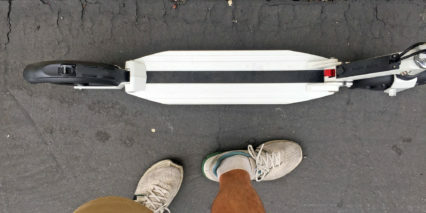 Hey guys, I live in NYC and currently own the E-twow booster model scooter. I rode both the EcoReco and this one before I bought it. 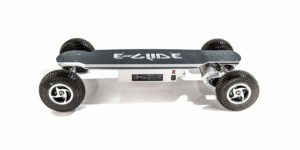 The E-twow was 10 pounds lighter and $300 cheaper and the ride is similar so it was a no brainer to me. The ride plate where you put your feet is bigger on the Eco Reco but I have size 11 feet and there is no problem with that. I am like 190 pounds and I average abot 18 miles to a charge and sometimes get to 21 miles. It really depends on where I’m riding it if there are a lot of inclines than I get less. I owned the old E-Twow Master model before which is no where near the power of the Booster and that model had trouble with hills. The booster is like night and day to that, of course when you are going up a 25 degree incline your going to slow down and lose speed but I have only had to kick it on really steep hills. I believe the 25 degrees they talk about is accurate but it is hard to get the 25 miles on a charge unless you don’t weigh a lot and are on flat roads. Ah Court, sounds like you might have gotten your hands on the Veetron VOMO scooter ;) I hope so! Because that would mean the scooter actually exists, and isn’t vaporware. I’ve been tempted to get one on Indiegogo, but wanted some assurance they are actually going to deliver. For those not in the know, the VOMO is sorta like an EcoReco on steroids. 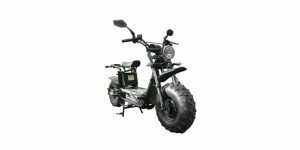 It looks a lot like an EcoReco, but has a 350 watt motor instead of 250 watts, comes with either an 8.5 or 11.5 amp Li Ion battery, has multiple power settings, and yes…a real-deal, 8″ inflatable tire! I understand why EcoReco and E-Twow don’t utilize inflatable tires. But really they should, because the ride tends to improve dramatically when you use standard air-filled tires. So much so, that a suspension system becomes unnecessary. Yes you can get a flat tire, but flats with these smaller tires are very easy to repair or replace. And in my opinion the improvement in ride quality more than outweighs any advantage from having airless tires. Not having regen braking is no big deal to me. I’m not convinced regen braking on these small machines makes a dramatic difference anyway. And with the VOMO you have an effective disk brake and a larger battery. Both of those things negate any need for regen braking. I hope this is the scooter you’re talking about, Court. I’d love to see one “in the wild”! I feel like that 175lbs limit will eliminate a lot of customers. I’m 5’10” and 170lbs plus I’d like to carry some gear. The new Booster they are selling here in the U.S. now has new hand grips so the button is now on outside of rubber so it’s simple to fold the handlebars down. Awesome XD glad it helped you out Kaylan! Hi [email protected] Sorry for the delayed reply here… I’m waiting for some assets to post the final review but you can preview the video portion on YouTube here. Hope this helps! 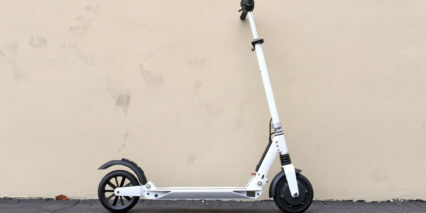 The scooter looks very similar to some others I’ve seen on the market, I liked the setup and price. I’ve just got myself an E TWOW booster, and don’t you guys feel that the strength of the brake is too strong? Often when I’m braking, I felt that I’m gonna fly off from the scooter! It comes to a stop too quickly. And the rear brake, it isn’t really a manual brake at all! It is a manual brake + regenerative brake, so using this, I felt that I’m really gonna fly off from the scooter. By the way, you can change the settings of the throttle to start immediately without kick starting it. Just turn off the system, hold down the front brake lever, turn on the system while still holding down the front brake lever, and press down the throttle lever 2 times, it will then turn off/on the kick start function. Also, for the cruising mode (which means your scooter will travel at the same speed without you holding down the throttle lever after 3-5 seconds of consecutive speed), just repeat the above mentioned, but this time, press the throttle lever 3 times instead of 2. In a nutshell, I like and love this scooter, but, the braking strength is too sudden and too strong. saw from your video, your regenerative braking seems to be alot more smoother than mine. Did you just press the brake lever once and release it quickly? I got too borrow this a week and noticed it was extremly difficullt to fold. The red button would not move and we had use much force. Did you notice this? Also, just must be WAY off suggesting the rear break has regen? To “regen” electricity you have to do that through an electric motor. The rear brake is just a break. or did you hear anything else? Hi Patrick, during my tests the rear brake acted like a skid to slow the E-Twow physically but also triggered a motor brake. I believe it does have some regen capacity. Does the regen braking allow using the brake constantly while descending large hills? Manual brakes would overheat and cause excessive wear, so just curious about this. I live in an area with lots of hills. Hi Dan, I was’t able to test this on larger hills but it did activate the regen even without pushing all the way down to “skid” on the tire. I think it would work alright but have heard that if a battery is completely full regen won’t work as well because there’s nowhere to send the electricity being generated. – your video turned out quite nicely. What divide did you use? I feel virtually no resistance at all when the power is off. If you keep the battery in the scooter and check it on the plane, I have not had a problem. This is not the same kind of battery that the hoverboards are using. I have the carry bag with wheels they sell online for when I travel. Patrick, the folding is very simple once you know how to do it. 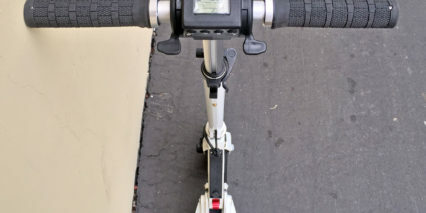 It’s a 2 step process you have to push on the red lever with your foot while pushing slightly forward on handlebars otherwise you will break the locking mechanism by forcing it. They have a video on the website etwow.com that shows the process. Regarding the rear brake I found out from riding that if you push softly on it , it works as a friction brake and if you push hard it has a built in sensor the cuts the motor off for emergency stopping. Art, I use my scooter in NYC and when I go to Brooklyn sometimes and push the scooter to save battery life while the motor is off there is virtually no resistance at all. Regarding the plane if you keep the battery in the scooter and you check the scooter in, I have not had a problem. I have the carry bag with wheels they sell online and have traveled with it 4 times. I know it’s a different type of battery than in the exploding hoverboards. It’s a lithium polymer not lithium ion, I believe. JC, it took me awhile to get used to the rear brake. I don’t have a problem with the front brakes-it’ a magnetic braking system so it kind of slows you gradually and the rear if you push gently will slow you by friction if you push down hard it hits the sensor which automatically kills the motor. This is for emergency stopping. Sorry just really passionate about the product and just want everyone to have the accurate info from someone who has 850 miles on it. I noticed a comment about the weight restrictions which did not seem right so I called the distributor here in the U.S. The limit is not 175 lbs. with the Booster model, it’s 250 lbs. and it can hold more. 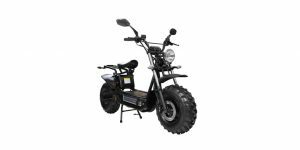 They said you may not get the same battery life and may struggle up hills with heavier weights but it can handle the weight. There is no speed difference between the M5 and the Booster E-twow. I’ve owned both and the M5 may claim to go faster but it’s not accurate. My M5 hit 18 mph going down a hill but it takes a long time to get to that speed with the rear wheel drive. It has no where near the torque of the Booster. The Booster states 18 mph but only because of the U.S. regulations( I heard this at a bike show seminar) and my kids have hit 20 mph plus. I can hit 20 mph on my Booster going down hills but hitting 18 mph on flat ground is not a problem at all. The smaller riding platform is really just a problem if you have really big feet otherwise it is not an issue and for being more than 10 lbs. lighter, the Etwow is the better choice for me. 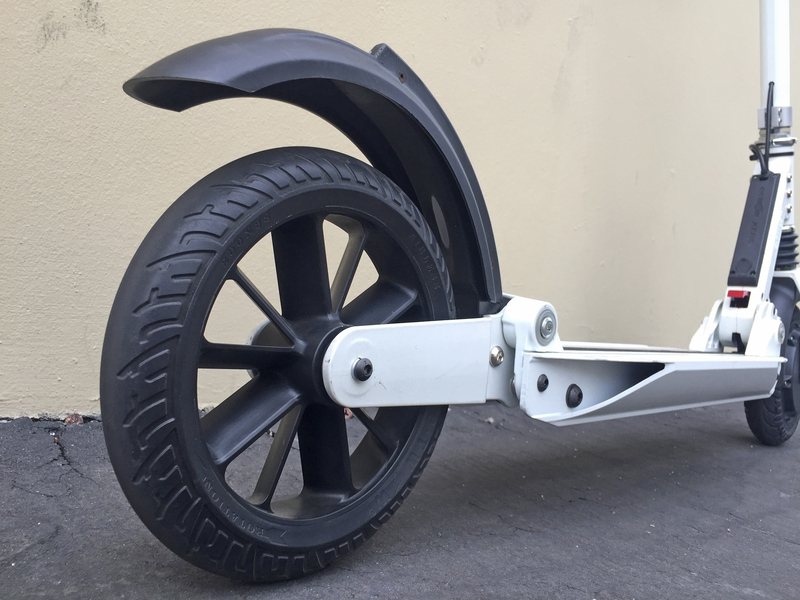 I’d stay away from the new kickstarted campain scooters as you will have issues and it’s important to be able to get support and parts if you need it. Eco Reco and E-twow are established reputable companies that have been around for years. E-twow has a great support team here in the U.S. not sure on Eco Reco sold mine before I had an issue, it was just way too heavy and good luck trying to go up a hill with the M5. Thanks a for all the inputs Jordan. I ended up buying M5 after giving serious thoughts about both the scooters. It’s a tough decision to decide between the two, finally just went with gut feeling and looks (I like the solid looks of ECORECO). Just wanted to add my experience with the new M5 with Air Tyre in front, it’s way smoother then the old M3 I had. It’s seems faster to me, at certain stretches (which are not downhill) it reaches 24 mph. Also on my regular route from Foster City to Hilsdale Caltrain station there are 2 bridges and scooter perform really well on those. But I totally agree about the weight, I totally envy e-twow being so light. Thanx for the video/written review and spec chart. 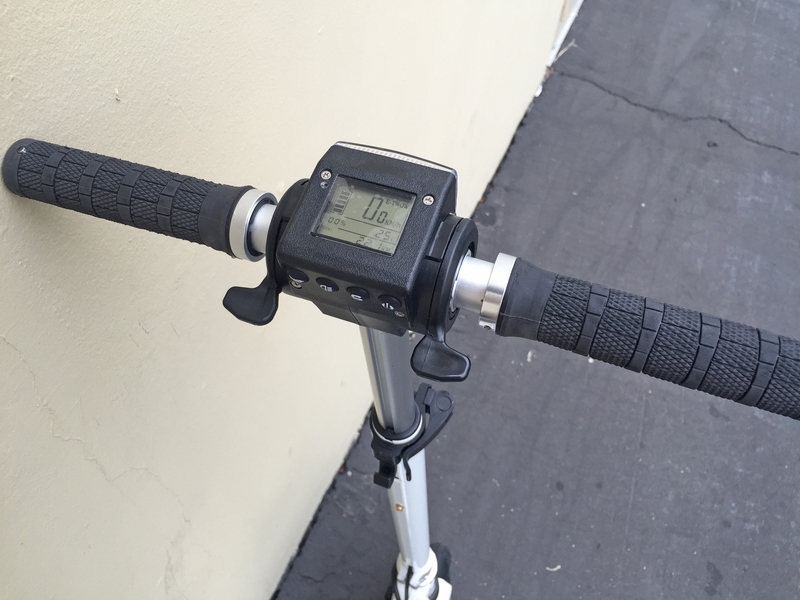 I test rode the eco reco and e-twow. I was ready to dismiss the idea of buying an electric scooter when I picked up the eco reco. If they’re this heavy it might not be a good commuting idea. Then I picked up the e-twow and I was reassured. 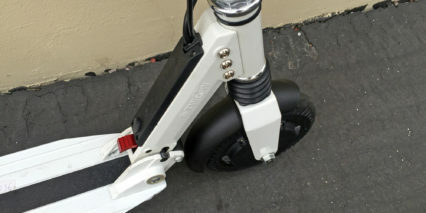 I like the idea that the e-twow looks like a push scooter and may be a camouflaging effect for NYPD. I was interested in your comparison between e-twow and glion. The glion is less expensive but the e-twow has a thorough dash plus LED light. 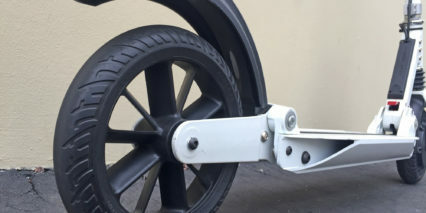 This is also part of the push scooter design but I like having a physical brake if needed. I forgot to ask if the glion had any suspension assist? 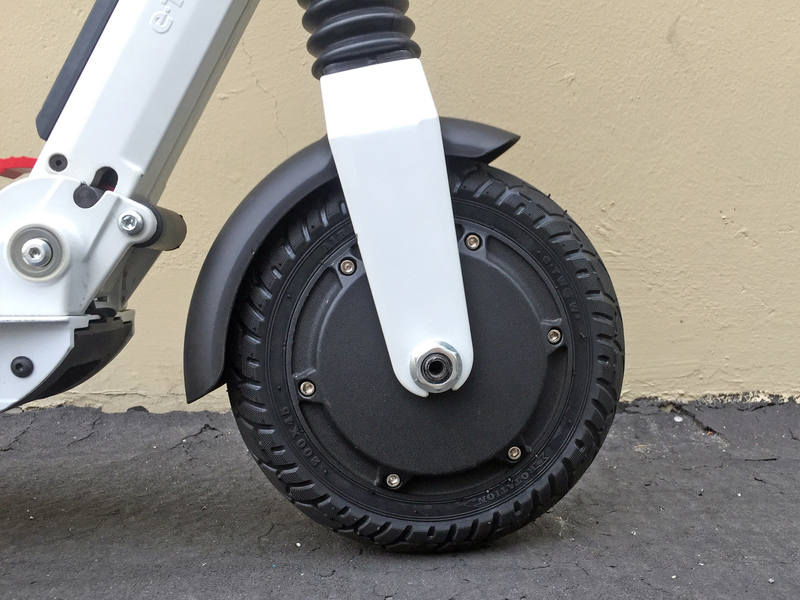 Hi ToNy, no the Glion kick scooters that I have reviewed didn’t have suspension and the tires are honeycomb so they tend to ride a bit rough (but won’t go flat). The newest model is cool because it has a little handle like a dolly that lets you pull it vs. carrying it. 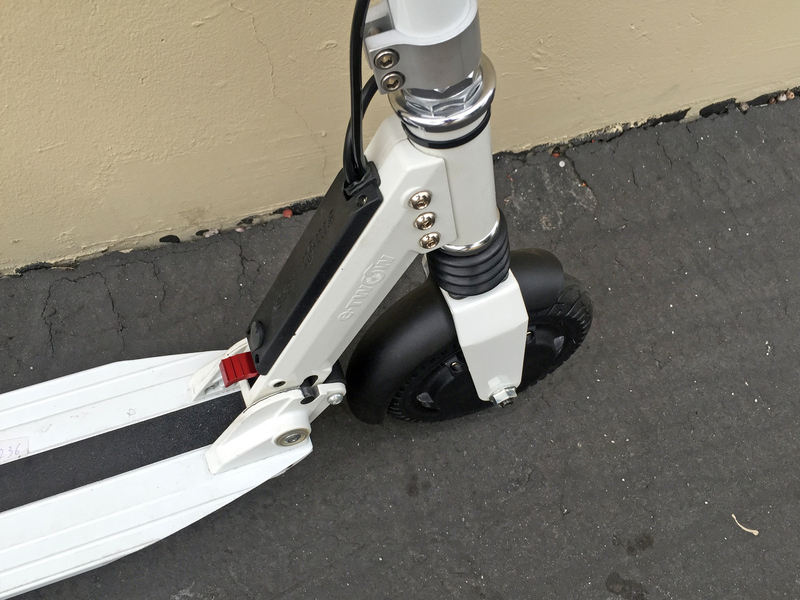 From my initial inspection, this is a well made electric scooter with a solid feel and a modern slim design. From demo riding this scooter and the Eco Reco, I knew I wanted the E-twow booster. If for nothing else than the lighter weight, this scooter is better. 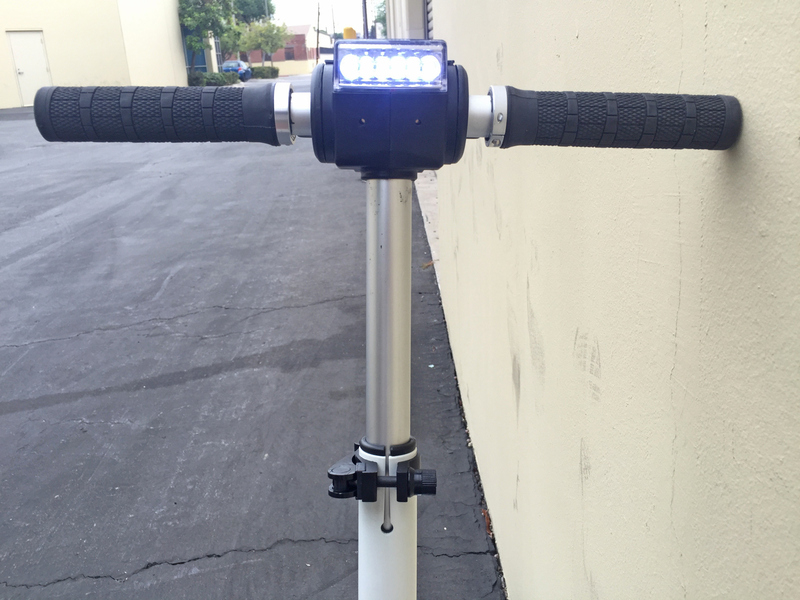 The scooter has a full function LED screen that fits with its narrow profile. 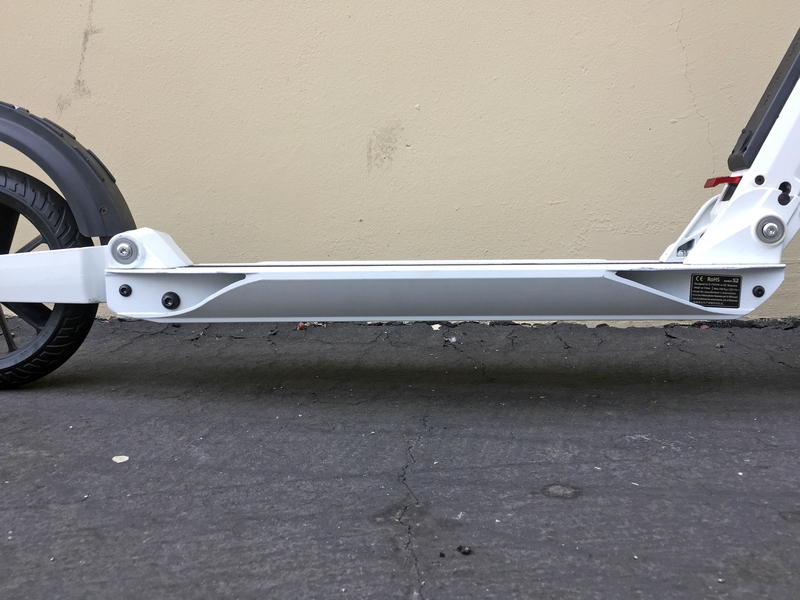 This give it a look that resembles a regular push scooter. That design is helpful if NYPD starts staring and noticing my scooter as I whiz by. If needed, I can forgo the electric assist and start pushing with my legs. The 6 LED front headlight lets others know I’m coming and it does illuminate the path ahead somewhat. I didn’t know this before I purchased it but it has a small red LED light towards the back of the rear fender/brake. When you use the front magnetic hand brake or the rear step brake it glows brighter like a vehicle brake light. Nice feature. I don’t find the throttle or hand brake excessively grabby or abrupt. There is a learning curve and you should accept some non-smooth acceleration or braking. It’s not an expensive sports car so I didn’t expect such refinement. It does fold up well so that I can stand it up and keep it along with my backpack between my legs when I ride the subway. NO “manspreading” here whether I have the scooter with me or not. The dual suspension does smooth out the beautiful and well tax funded roads in NYC. The imaginary potholes and dips in the road are well navigated and forgiven with this scooter. 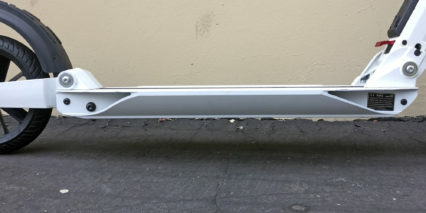 It handles the sidewalk and road with confidence. I’m getting the hang of collapsing the scooter with the red locking piece. 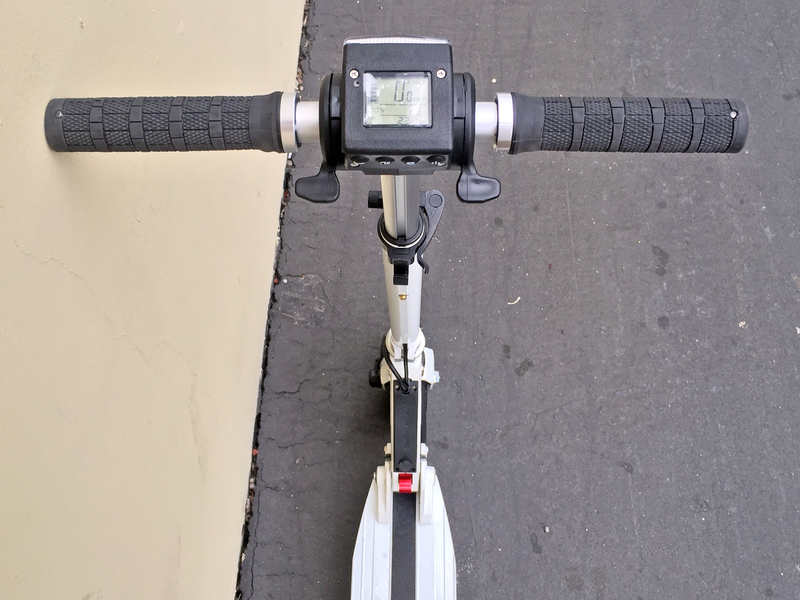 I push the handlebars forward a touch and then push it with my foot. Conversely, I’m learning how to raise the handlebars and make sure it locks into place. I’ve taken off with the handlebars not properly locked and I’ve been quickly stopped had to raise the handlebars and push them forward aggressively. As expected this does cut down the walking portion of my commute. Where walking took 10 minutes, I can cut that down to 4. On another route, as a pedestrian it takes 12 minutes, as a motorized pedestrian it now takes 5. Over time, that time savings will justify the initial expense of the scooter. As a motorist that drives into the city, this will shorten the time it takes to go from the parking garage or parking space to your place of business. It will also allow you to expand your choice or location of parking garage or parking space. It’s a game changer. Hi Anthony, great writeup! Thanks for sharing your experience and mixing in some fun thoughts about the bumpy roads and how much it has cut down on your commute time… as well as the warning about folding, to make sure it’s locked in. Sounds like the E-Twow is working great for you so far and I love the feedback about the rear brake light! It will stand up on its own and there is a luggage type telescoping handle. Does the smaller dolley wheel always stay exposed? 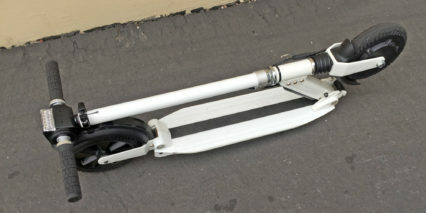 The etwow is lighter and you can use the center handle to push or pull the collapsed scooter. The dual suspension does make a difference. I just rode an older razor a5 and it feels jarring compared to the etwow. Have used the ECO (350Watt) for three weeks now. Best compromise of Weight Speed and Price that I could find. My weight is 75kg/165lbs and it will climb at 15Deg but not 20Deg. Pretty certain that you’ll be better off with a more powerful motor if you weigh more than 80kg/176lbs. (My daughter weighs only 55kg/121lbs and the difference in acceleration and climbing ability is quite noticeable). The front and rear suspension is perfect for my weight. All pro’s for me and no con’s. Build quality and materials used are both high. Claimed range/speed is honest. It’s fun and practical. Hi, Wonder if anybody has tried or own SUPER Booster? It`s a new version of a Booster. Thx. Hi Dus! I haven’t tried that one but I’ll definitely keep an eye out for it… thanks for the request and maybe someone else will chime in. After reading all these great reviews I bought a E TWOW booster. On my 4th trip with the scooter, when I was going down on a big hill, the scooter stopped working. The headlight works, the honk works, the screen shows all the information, the battery is fully charged but the throttle lever and the break lever do not work. Any idea what happened? Hmm, I haven’t heard of this Ron? Did you reach out to the company and hear anything back? I’d love to know what the issue is so that others could benefit from either avoiding or fixing if they are in a similar spot. Thanks for sharing this and good luck resolving it, if you have trouble reaching the company please let me know and I can try to help.